The unique Auro-Codec provides a 'one format solution' for next generation multimedia audio. Low set-up costs combined with affordable network & device components make Auro-3D® the most viable 3D audio solution. Theater owners praise the economy and practicality of Auro-3D® sound systems. Auro-3D®'s unique usage of height channels (combined with conventional speaker layouts) adds significant value for filmmakers, cinema owners and audiences worldwide. In order to reach full market potential, Auro Technologies has teamed up with Barco as exclusive partner for cinema. Auro 11.1 by Barco has already been installed or committed in over 550 cinemas worldwide. More than 125 international movies have been released in the format up to now. The system has also been adopted by several leading post-production facilities, like Skywalker Sound, The Dub Stage and MBS Studios Hong Kong. In addition, an increasing number of directors are embracing the new format. And, together with Barco, we have introduced AuroMax®, a revolutionary sound rendering technology that combines the best characteristics of object-based technology with the Auro 11.1 immersive sound format for the most realistic and natural immersive experience available. The increasing popularity of AV systems has altered the home entertainment landscape. Consumers want immersive experiences that are easily accessible and customized to their particular taste. Auro-3D® satisfies their expectation for a discreet, flexible home solution that is easy to install and use. The Auro-3D® format is designed to be built on top of existing systems. Gamers have come to expect video games to deliver the deepest possible level of immersion and realism. dazzling soundscapes that effectively transport players into the middle of the action. Game sound designers are familiar with the dreaded 'bottleneck' problem: a vector-based 3D-mix is created in the game code using 24 channels of PCM reduced to 8 channels by the HDMI interface. Auro-3D®'s innovative technology guarantees a real-time conversion back to 24 channels in uncompressed PCM quality with near-zero latency. Introducing Auro Technology into your car media server means full spectrum 3D audio is now at your fingertips. Together with the direct reproduction of native three-dimensional audio via the Auro-Codec, Auro-3D® also reveals all Mono/Stereo/Surround content in the highest quality 9.1 upmix. 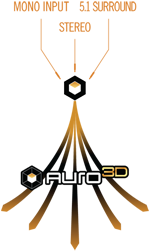 Auro-3D® introduces the gold standard upmixing enhancement for the automotive market. Until now, all car audio upmixing engines delivered compromised quality.  Sound is typically degraded when switching between Mono and Stereo as a result of natively poor signal transmission. Auro-3D®'s powerful next generation upmixing algorithm delivers an extremely stable sound image, regardless of source. Our innovative technology can be tailored to suit your automotive specifications. Auro allows the delivery of an originally mixed Surround signal (in PCM) into a dynamically controlled Stereo carrier, making it the ideal solution for today's broadcast market. - Auro 9.1 is the next step in broadcast audio, a format that will soon come to the market. - Stereoscopic 3D broadcasts will never be fully immersive without the introduction of complementary 3D audio. Mobile devices currently dominate the consumer hardware landscape. Consumers now expect improvements in sound quality alongside advances in display technology. Auro-3D® answers this call for heightened audio quality by greatly expanding the sound experience of any mobile device. Our powerful technology is capable of producing enhanced Mono, Stereo and Surround content as well as three-dimensional sound within a single format. Since Auro-3D® has been optimized for streaming content, today's mobile audio experience can go above and beyond expectation! Audio professionals see the advantages offered by the Auro-3D® Creative Tool Suite. For more detailed information on the products for sale, please click here. are the most powerful and affordable solution for 3D audio creation. Additional tools that allow the groundbreaking Auro-3D® technology to be used in the existing standard formats for uncompressed audio (PCM, CD Quality or better) with much less bandwidth than is used today for Surround 5.1/7.1 (2D) in PCM. 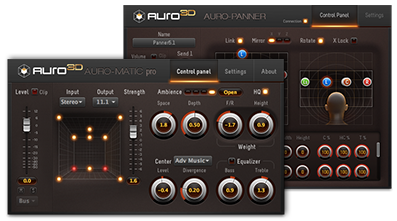 Auro-Matic® Pro & Auro-Panner™ plugins are designed to offer creative professionals tools capable of creating an immersive 3D sound experience using source material not originally recorded in three dimensions. Auro Mixing Engine solves technical limitations present in DAW stations (e.g. ProTools is limited to an 8 channel monitoring system while the Auro-3D® listening formats require a minimum of 10 channels). Auro-Codec® Encoder plugin permits the simultaneous mixing of both 2D and 3D masters. This allows the efficient creation of multiple masters within the time typically required to produce the mix in a single format. Auro-Codec® reference Decoder for quality control and play back of Auro encoded content. Unified Workflow - The Auro-3D® Creative Tool Suite facilitates the simultaneous creation of both channel-based and object-based masters. Single File Distribution is a unique feature of the Auro-Codec. It creates a 'Single File Distribution master in PCM' that allows the distribution of all Auro-3D® formats within the existing PCM market standards - the original PCM Surround Mix is incorporated in a standard Stereo PCM file (=> 2 artistic controlled masters in 1 Stereo PCM carrier). The Auro 11.1 format can be artistically down-mixed into a standard 5.1 PCM stream using the Auro-Codec® Encoder - a patented, exclusive component of the Auro-Codec®. The Auro-3D® Creative Tool Suite received 4 Best of Show Awards at Namm 2015. Enhanced realism will dominate the entertainment environment of tomorrow. Audio professionals will deliver three-dimensional sound experiences that truly immerse audiences. Film and game producers know that sound generates more emotional involvement than images do. Until now, audio's full emotional potential has remained untapped due to format complications and widespread workflow incompatibilities. Auro-3D® presents a revolutionary new audio format that enables deeper levels of immersion free of unnecessary complication. With its highly flexible tools, Auro-3D® facilitates a greater degree of creativity with broader technical options. This powerful technology gives industry the tools necessary to bring richer forms of entertainment to market. Auro-3D®'s combined technical and commercial viability makes it the foremost 3D audio solution on the market. In order to download technical documents, please select the document(s) and fill in your email address. The requested files will be emailed. 33 / 2 "B" Korablestroiteley Str.